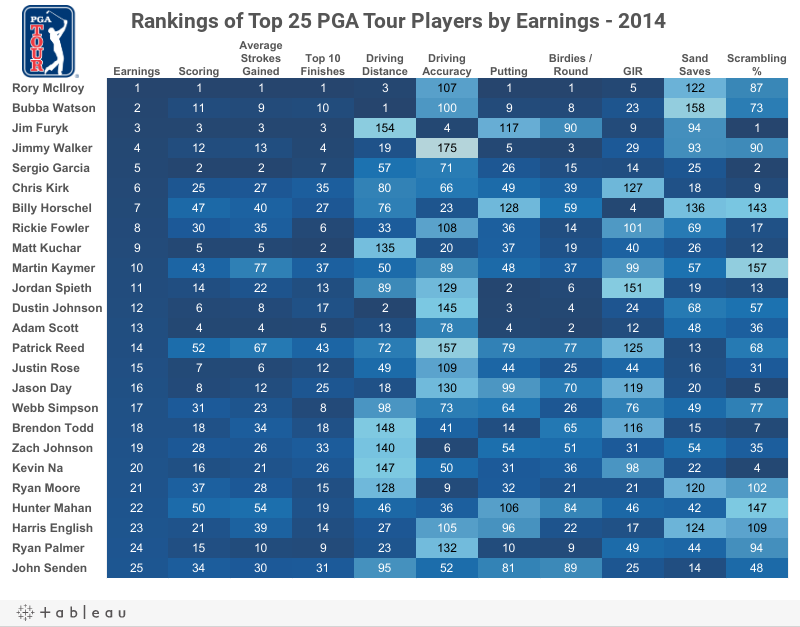 Since the PGA Tour season wrapped up, I thought I would take a look at the top 25 players on the money list through the end of the regular season and see how they ranked in key categories. A couple of things really jumped out when you look at the heat map below. Jimmy Walker has the worst Driving Accuracy on tour, yet finished 4th on the money list due to 3 wins early in the season and his strong putting. In fact, driving accuracy as a whole doesn't appear to be too important in regards to success on the PGA Tour, unless your name is Jim Furyk. Furyk is one of the shortest hitters on the Tour and not a very good putter at this point in his career. However, he is one the the best ball strikers on tour, both off the tee and from the fairway. He also has one of the best short games with the fewest bogeys per round on tour.